In this overview of his book series Science Fiction: The Evolutionary Mythology of the Future, Thomas Lombardo offers a panoramic vision of the evolution of science fiction, set within the history of culture, science, and philosophy. Science fiction is the most visible and influential modern form of futurist thinking and imagination in the contemporary world. But why is it so popular? Science fiction speaks to the whole person—intellect, imagination, emotion, and the senses—providing fantastical and visionary stories that enlighten, motivate, and engage us, expanding our consciousness and generating total person immersion. For many people science fiction has became a way of life and a paradigm for the creation of the future. It is the evolutionary mythology of the future providing dramatic narratives of the future that both inspire and inform, as well as frighten us, about the possibilities of tomorrow. As futurist narrative, science fiction encompasses the future of everything, and even extends beyond into alternative and higher dimensional realities. At the cutting edge of humanity’s creative journey into tomorrow, science fiction energizes and empowers us in thoughtfully and imaginatively orchestrating and guiding our ongoing evolution. 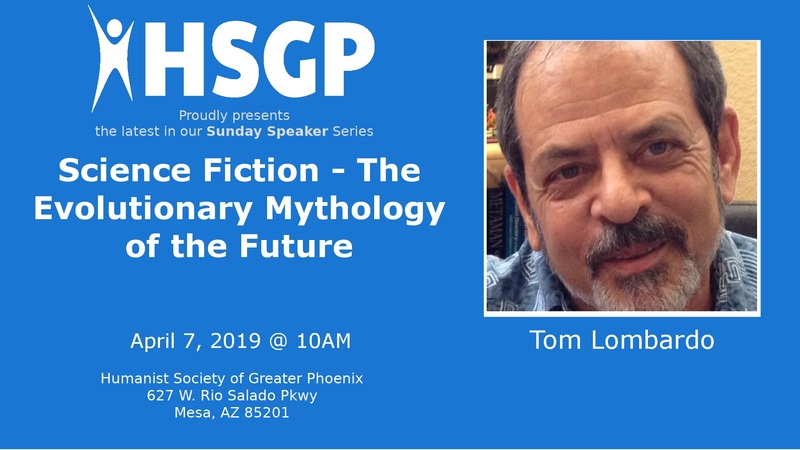 In this overview of his book series Science Fiction: The Evolutionary Mythology of the Future, Thomas Lombardo offers a panoramic vision of the evolution of science fiction, set within the history of culture, science, and philosophy. He considers how science fiction has both influenced and been influenced by the evolution of human society and human thought. He explains the intimate connection between science fiction and both science and myth and illuminates the integral nature of science fiction within the ongoing evolution of the human mind, human society, and our consciousness of the future. A Children's Program is available during the Speaker Meeting. Please see the HSGP Meetup for the Children's Program at this meeting for more information and to RSVP with the number of children attending. Need Accessibility Options? Send an email to president@hsgp.org with Accessibility Options in the subject line and let us know about your needs.